Are You Recovering or Just Resting? Today, I’d like to talk about recovery. No, not economic recovery—though that would be lovely—but physiological recovery from the stressors placed upon us by our modern physical world. These two words, “rest” and “recovery,” have distinctly different meanings when applied to health, fitness or athletic contexts. Recovery can encompass many different behaviors and strategies, but it is fundamentally different than just resting. Rest is simply the absence of effort or movement—the absence of exertion. Think taking a day off from exercise or sport, napping, chilling on the couch, rotting your brain with Jersey Shore or Lost reruns, and going to bed nice and early so you get adequate sleep. All of that is fine and good, but resting is only one small part of true recovery. Recovery is the restorative process by which you regain a state of “normalcy”; healthy and in balance. (If your “normal” is not “healthy,” perhaps you should spend some time considering that.) Recovery is far more than just taking a day off from training. Genuine recovery includes adequate rest, but also must include the engaged, deliberate execution of a cogent plan to offset the (physical and psychological) cost of your training. Merely taking a day or two off from exercise when you’re feeling overtrained (or All Banged Up) is, to put it bluntly, the slacker’s version of “recovery.” One of the many things that was underscored during my training with Rob MacDonald of Gym Jones is that recovery requires just as much (or more!) discipline as training itself. Which means if you’re training hard, a case could be made that you should spend more time focused on recovery than you do on training itself. Don’t have that much time in your busy, stressful life? It might mean a little less training and a little more time spent on recovery. Still don’t think that’s really necessary? Maybe you just don’t realize how stressful your life really is. Another way to put it is, “some is good, but more is not better.” Hormesis is at the core of our favorite refrain, “context matters,” and is reflected in our Whole9 Health Equation as the balance of Stress vs. Recovery. Why all the focus on stress? I wanted to give him a standing ovation for that. So what does that mean, in terms of hormesis and our Health Equation? If you’ve got a ton of psychological stress, that costs you something. It costs you recovery capacity. It cuts into your reserves. In fact, being chronically psychologically stressed is probably more damaging than overtraining or under-sleeping, though those are obviously poor behaviors, too. Think about your own life. Ask yourself if your “dose” of a stressor is appropriate for your context. There are lots of examples of stressors: intermittent fasting, high-intensity exercise, under-eating, cold showers or acute exposure to cold, sleep restriction, caffeine intake, eating extremely hot peppers… the list is long. *This is one of the reasons why I rarely recommend intermittent fasting to my consulting clients. Unsurprisingly, most of them are on the “too much” side of the stress scale, rating their daily stress at an average of 8 out of 10. These folks don’t have any “reserve” left to offset an additional stressor, which means adding IF on to their current health equation would do them more harm than good. IF may be a perfectly appropriate tool for other folks with different contexts, but it’s not for everyone. Exercise is an excellent example of hormesis in action. An appropriate “dose” of physical stress provokes a positive adaptation in your body (you get fitter), but dosing progressively larger and larger amounts of exercise can be seriously detrimental to your health. Make no mistake – excessive training (or, perhaps stated more accurately, under-recovering) can and commonly does have serious health consequences. And what look like “reasonable” training for one person might be way more stress than a different person has the capacity to adapt to. 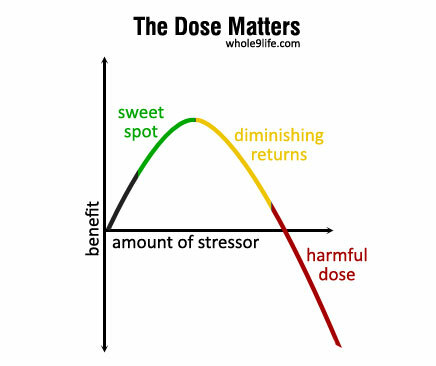 Clif Harski and Eva Twardokens, among other Smart People I know, talks about the “minimum effective dose,” that sweet spot on the hormesis graph. This is where healthy adaptation is occurring, but you’re on the safer side of the stress curve, not revving at the redline day in and day out. In the case of exercise, doing none is pretty unhealthy, but doing too much is unhealthy too. The real key is to find that sweet spot, where you’ll have optimal adaptation to the stressor without reaching the point of diminishing returns–or worse, when the exercise “takes” more from your health than it gives back. Like with other stressors, exercise is dose-dependent, and the appropriate dose for you depends almost entirely on you, your context, and your goals. You used to be excited about going to the gym – not so much anymore. Your performance (or lack thereof) is seriously stressing you out , and a poor workout ruins your day. You’ve got chronic muscle soreness after every workout, and/or that lingering “shoulder thing” that just won’t seem to heal. Your sleep pattern has become irregular. Even though you’re in bed for enough hours, you never feel well-rested in the morning. You need a Monster drink or three espressos to get fired up for your training sessions. You crave carbohydrates (sugar!) more than you used to. You’re getting sick a lot, or just can’t seem to kick that cold you picked up. You’re training hard and “eating right” but that little belly just isn’t going away. You’re actually gaining fat, instead of losing it. In case you’ve not experienced this eye-opening phenomenon firsthand, take my professional word for it: it takes a lot longer to recover from an overdrawn state than it took to get you there in the first place. Like paying off debt, it’s a prolonged and generally miserable process. I’m not trying to scare you – I’m simply sharing what I know in the hopes that it will save you some heartache. Take it or leave it. You don’t get fitter when you are training. Whether you are weightlifter, do Zumba, swing kettlebells, or run marathons… you get fitter when you are recovering from that training. Being committed to recovery means that sometimes you don’t train hard, even if you really want to, and even if everyone else is doing it. A commitment to recovery may mean that you take ice baths sometimes. It means that when all you want is pizza and a beer, you choose a nutritious meal instead. It means that you put away the computer/TV/smartphone/video game and go the heck to sleep. It means that you spend some intimate time with your foam roller, lacrosse ball, stick, ice pack, or other self-care tool/torture device. It may mean that you seek out a reputable practitioner of your preferred therapeutic approach: massage, Rolfing, acupuncture, chiropractic care, naturopathic or functional medicine. It might mean that you use your noggin’ and take a pass on a race or competition that really doesn’t matter in the grand scheme of Your Life and Health. It might even mean that you revisit your trip down Whole30 Lane. This is real recovery, and this is where this is where you reap the benefits of your hard (training) work. Finally, a few last words from your recovery sponsors. “Aerobic” is not a dirty word. If you’re passing on lower intensity, longer duration activity and exclusively working at a high-intensity, I think that’s a short-sighted perspective. For my clients, I recommend regularly spending at least a half-hour doing easy activity as part of your recovery practices. Riding the Airdyne, walking, swimming, or biking for 30-90 (long, slow, boring) minutes expedites recovery from hard training, improves metabolic efficiency (especially in folks on a low-ish carb, high-ish fat diet), and improves cardiovascular health. Don’t confuse durations over a half hour with “chronic cardio” – the long duration, moderate-to-high intensity stuff that really nails you. To be clear, no one was ever harmed by a two hour hike or an easy spin on the bike with their kids. Keeping the intensity low is the key to recovery activities, and including some long, easy stuff in your routine improves health and recovery from hard training—which ultimately will improve performance in your higher-intensity sport or exercise program. Regardless of how you choose to step your recovery up (perhaps, in part, by stepping your training down), it’s time. Summer’s activities are just around the corner, and if you play a sport, participate in outdoor pursuits, or simply like comparing your physical capacity to others (or yourself! ), now is the time to invest in yourself. Now. Not tomorrow, or next week, or after a few more workouts. Now. You owe it to your Future You not just to rest, but to recover. “Aerobic is not a dirty word” – couldn’t agree more. Somehow we’ve correlated aerobic activity (like GASP – running) with chronic, slow and steady performance. Not all aerobic activity is chronic , and yes – some steady running or cycling sessions can work into a well-balanced fitness regime. I’ll be the first to state that cardio isn’t the most effective option for improved health and fitness markets, or for losing fat – but it does have it’s place and time. So often, especially in the younger folks in the ancestral health community, people want to know what *more* they can do: lift more, carb-restrict more, fast more, micromanage more, when many times what our bodies are begging us to do is LESS. Far-too-common things like adrenal exhaustion, menstrual irregularities, hormone imbalances, and resistant fat loss despite doing “all the right things” are warning bells that Somethin’. Ain’t. Right. It sounds so counterintuitive to those who are used to pushing as hard as they can for as long as they can, but eventually your body won’t *let* you. It’ll wallop you over the head with some kind of imbalance until it gets unpleasant enough that it *forces* you to take a breather. I appreciate hearing your perspective on the importance of recovery. I agree with your message and hope other trainers take the time to read it and realize that promoting recovery time is as important as time spent working out. Great post… Completely resonates with me right now. It’s so easy to get caught up in the “more is better” philosophy. Once you get that healthy addiction like feeling to training and chasing capability… it takes almost more discipline to get the proper amount of rest required for optimal recovery. This is common with high intensity training as it pays off great dividends on your physical performance in addition to hormone health it can be extremely taxing on your nervous system and immune system. Working in the health field, I’ve seen Psychological stress wreak havoc on people’s digestive systems. Being conscious of supplying yourself with the raw materials required to feed the demand that was created as well as regulating cortisol can be a major influencer in growth and performance. Try shifting your focus to purpose driven ingredients especially foods rich in magnesium and vitamin C around times of stress (fight or flight modes).